Astronomers using the NASA/ESA Hubble Space Telescope have mapped the mass within a galaxy cluster more precisely than ever before. Created using observations from Hubble's Frontier Fields observing programme, the map shows the amount and distribution of mass within MCS J0416.1–2403, a massive galaxy cluster found to be 160 trillion times the mass of the Sun. The detail in this mass map was made possible thanks to the unprecedented depth of data provided by new Hubble observations, and the cosmic phenomenon known as strong gravitational lensing. Measuring the amount and distribution of mass within distant objects in the Universe can be very difficult. 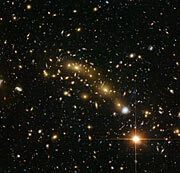 A trick often used by astronomers is to explore the contents of large clusters of galaxies by studying the gravitational effects they have on the light from very distant objects beyond them. This is one of the main goals of Hubble's Frontier Fields, an ambitious observing programme scanning six different galaxy clusters — including MCS J0416.1–2403, the cluster shown in this stunning new image . Large clumps of mass in the Universe warp and distort the space-time around them. Acting like lenses, they appear to magnify and bend light that travels through them from more distant objects . 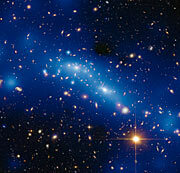 Despite their large masses, the effect of galaxy clusters on their surroundings is usually quite minimal. For the most part they cause what is known as weak lensing, making even more distant sources appear as only slightly more elliptical or smeared across the sky. However, when the cluster is large and dense enough and the alignment of cluster and distant object is just right, the effects can be more dramatic. The images of normal galaxies can be transformed into rings and sweeping arcs of light, even appearing several times within the same image. 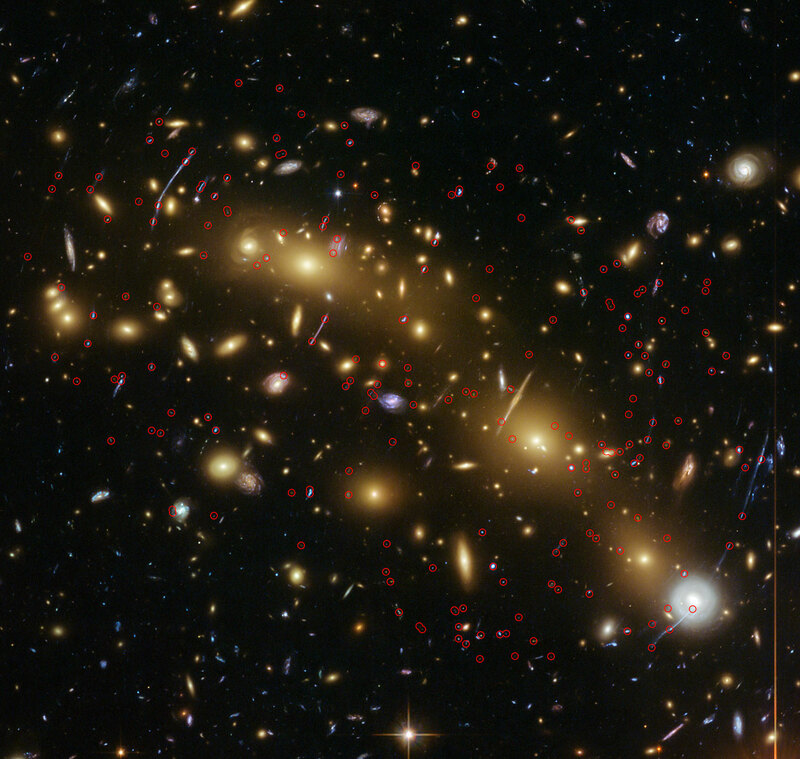 This effect is known as strong lensing, and it is this phenomenon, seen around the six galaxy clusters targeted by the Frontier Fields programme, that has been used to map the mass distribution of MCS J0416.1–2403, using the new Hubble data. Using Hubble's Advanced Camera for Surveys, the astronomers identified 51 new multiply imaged galaxies around the cluster, quadrupling the number found in previous surveys and bringing the grand total of lensed galaxies to 68. Because these galaxies are seen several times this equates to almost 200 individual strongly lensed images which can be seen across the frame. 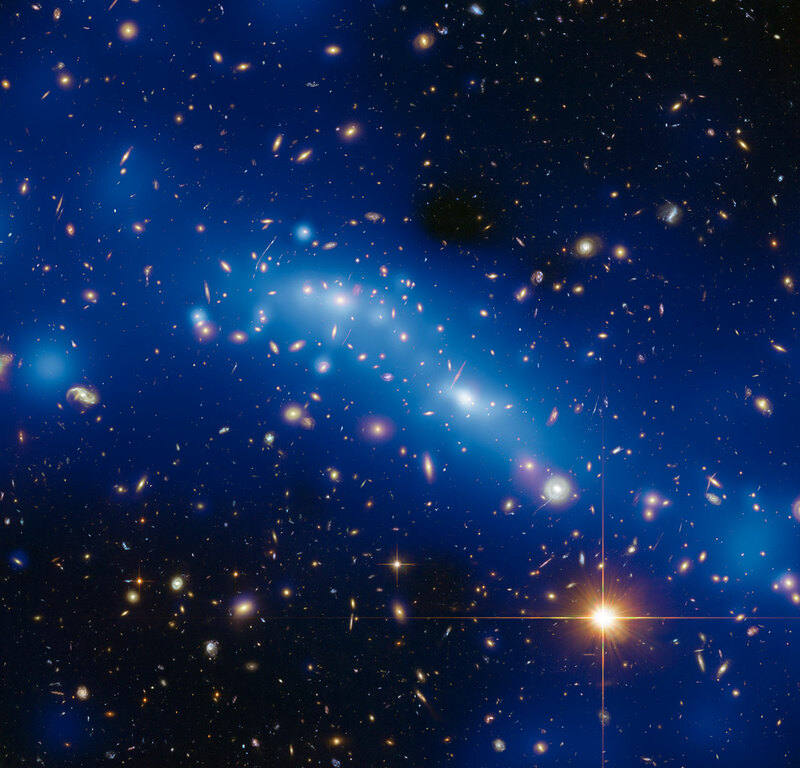 This effect has allowed Jauzac and her colleagues to calculate the distribution of visible and dark matter in the cluster and produce a highly constrained map of its mass . "Although we’ve known how to map the mass of a cluster using strong lensing for more than twenty years, it’s taken a long time to get telescopes that can make sufficiently deep and sharp observations, and for our models to become sophisticated enough for us to map, in such unprecedented detail, a system as complicated as MCS J0416.1–2403," says team member Jean-Paul Kneib. The total mass within MCS J0416.1-2403 — modelled to be over 650 000 light-years across — was found to be 160 trillion times the mass of the Sun. This measurement is several times more precise than any other cluster map, and is the most precise ever produced . By precisely pinpointing where the mass resides within clusters like this one, the astronomers are also measuring the warping of space-time with high precision. "Frontier Fields' observations and gravitational lensing techniques have opened up a way to very precisely characterise distant objects — in this case a cluster so far away that its light has taken four and a half billion years to reach us," adds Jean-Paul Kneib. "But, we will not stop here. To get a full picture of the mass we need to include weak lensing measurements too. Whilst it can only give a rough estimate of the inner core mass of a cluster, weak lensing provides valuable information about the mass surrounding the cluster core." The team will continue to study the cluster using ultra-deep Hubble imaging and detailed strong and weak lensing information to map the outer regions of the cluster as well as its inner core, and will thus be able to detect substructures in the cluster's surroundings. They will also take advantage of X-ray measurements of hot gas and spectroscopic redshifts to map the contents of the cluster, evaluating the respective contribution of dark matter, gas and stars . The results of the study will be published online in Monthly Notices of the Royal Astronomical Society on 24 July 2014. The cluster is also known as MACS J0416.1–2403. The warping of space-time by large objects in the Universe was one of the predictions of Albert Einstein’s theory of general relativity. 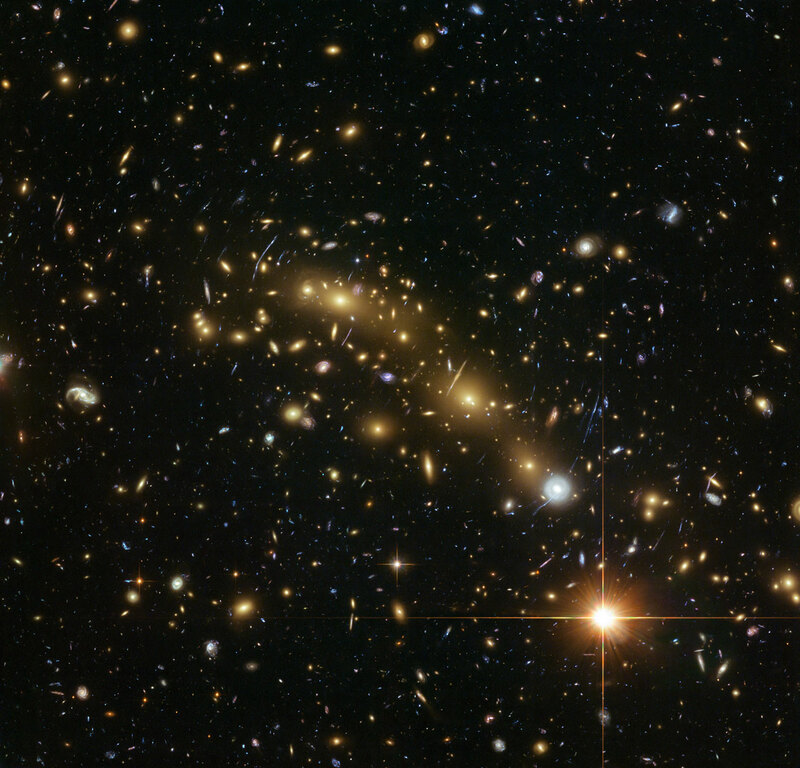 Gravitational lensing is one of the few methods astronomers have to find out about dark matter. Dark matter, which makes up around three quarters of all matter in the Universe, cannot be seen directly as it does not emit or reflect any light, and can pass through other matter without friction (it is collisionless). It interacts only by gravity, and its presence must be deduced from its gravitational effects. The uncertainty on the measurement is only around 0.5%, or 1 trillion times the mass of the sun. This may not seem precise but it is for a measurement such as this. NASA's Chandra X-ray Observatory was used to obtain X-ray measurements of hot gas in the cluster and ground based observatories provide the data needed to measure spectroscopic redshifts. The international team of astronomers in this study consists of M. Jauzac (Durham University, UK and Astrophysics & Cosmology Research Unit, South Africa); B. Clement (University of Arizona, USA); M. Limousin (Laboratoire d’Astrophysique de Marseille, France and University of Copenhagen, Denmark); J. Richard (Université Lyon, France); E. Jullo (Laboratoire d’Astrophysique de Marseille, France); H. Ebeling (University of Hawaii, USA); H. Atek (Ecole Polytechnique Fédérale de Lausanne, Switzerland); J.-P. Kneib (Ecole Polytechnique Fédérale de Lausanne, Switzerland and Laboratoire d’Astrophysique de Marseille, France); K. Knowles (University of KwaZulu-Natal, South Africa); P. Natarajan (Yale University, USA); D. Eckert (University of Geneva, Switzerland); E. Egami (University of Arizona, USA); R. Massey (Durham University, UK); and M. Rexroth (Ecole Polytechnique Fédérale de Lausanne, Switzerland).